At lower right, the artist's estate sale stamp (Lugt 461) in red paint: "vente Corot"; on the verso of the millboard, the artist's estate sale stamp in red wax, and in black stencil: "Detrimont/Tableaux/Dorure/Rue Laffite 27 Paris." A countryside path cuts across a mustard-yellow field and slopes downward toward a small village. Under a cloudless sky, crisp, strong sunlight brightens a zigzag row of roofs and chimneys. Contrasting shadows are cast from rooftop to rooftop. In the right foreground, a less sharply defined verdant mass balances the geometrical order of the architecture. During the summer of 1830, Jean-Baptiste-Camille Corot left his native Paris and traveled in northern and central France. The oil study was most likely produced during this sojourn. Corot painted the view in the out-of-doors. Scholars believe this work was not intended for exhibition or sale nor did it serve as a preliminary study for a larger picture. 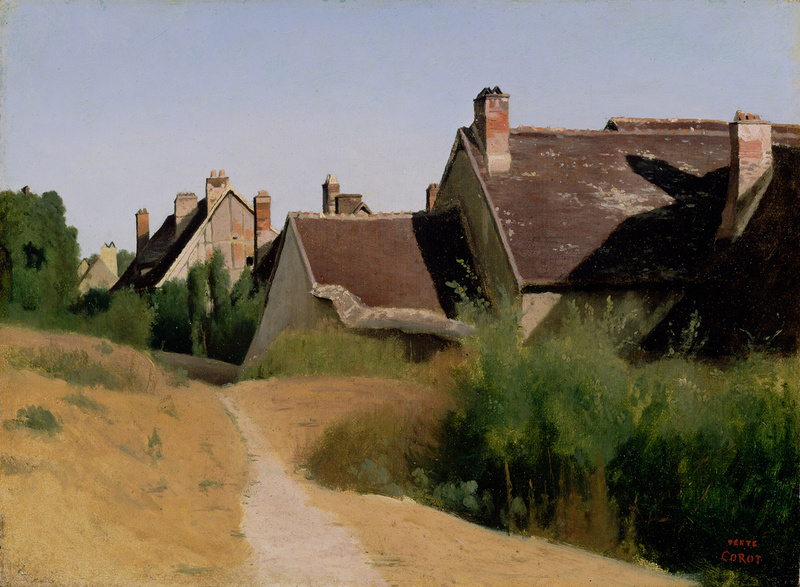 Instead, it is likely the work remained in Corot's studio as an exploration of the effects of light and nature on geometric architectural forms. Léon Chamouillet, 1839 - 1933, by inheritance within the Chamouillet family. W. M. Brady & Co., Inc. (New York, New York), sold to the J. Paul Getty Museum, 2002. Hôtel Drouot, Paris. Catalogue des tableaux, études, esquisses, dessins, et eaux-fortes par Corot [...]. May 26-June 9, 1875, p. 47, lot 348. Robaut, Alfred, and Étienne Moreau-Nelaton. L'oeuvre de Corot [...] Catalogue raisonné et illustré, précédé de l'histoire de Corot et de ses oeuvres [...]. 4 vols. (Paris: H. Floury, 1905; repr., Paris: Léonce Laget, 1965), vol. 2, p. 120, no. 342, ill.
Mayenne Hôtel des Ventes advertisement. La gazette de l'Hôtel Drouot, no. 11 (March 16, 2001), p. 194, ill.
W. M. Brady & Co. advertisement. The International Fine Art Fair (London: The International Fine Art Fair Ltd., 2002), p. 39, ill.
Josenhans, Frauke, and Mary Morton. Sur le motif: Painting in Nature around 1800, exh. brochure (Los Angeles: J. Paul Getty Museum, 2008), unpaginated, fig. 6. "Calendar." Burlington Magazine 150, no. 1269 (December 2008), p. 860, fig. 62. Pagel, David. "The Super Natural." Los Angeles Times (December 1, 2008), p. E2. Josenhans, Frauke. "Sur le Motif: Painting in Nature around 1800." Getty Research Journal, no. 1 (2009), pp. 182-84, fig. 2.